Williamson Hall is the village hall for Abernethy and its surrounds. 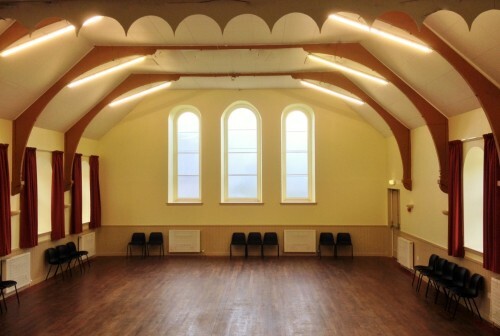 Run by a voluntary committee as a charity / not for profit community resource, it has was recently (2014) refurbished, insulated and re-decorated and is the perfect warm and welcoming venue for your party, concert, ceilidh or fundraising event. We are working hard to continuously improve the hall. 2015/16 saw us install a new fusebox and undertake works to overhaul the electric wiring as well as redecorating the kitchen. Earlier in 2017 we laid new flooring in the corridor, kitchen and ante-room and a new set of front doors were fitted. We’ve just installed a new fire alarm system and re-decorated the corridors, ante-room and entrances. We’re now looking at ways to improve the shower room and the men’s loos. Please do consider us for any event you are having as the more income we have the more we can achieve. You can view our gallery to see more pictures of the refurbished hall. We have a large refurbished main hall with stage, an ante/committee room, a PA system and event lighting, and an accessible (disabled) toilet and family friendly baby change facilities. We accommodate most events comfortably (up to a maximum of 100 attendees). Our modern fully fitted kitchen has a 6 ring hob and double oven, a catering standard dishwasher, an urn, a microwave, a large fridge and a freezer. We have 100+ crockery place settings meaning you can also cater for your event with ease. We even have a disco ball. The hall is a registered charity (part of SC 003200) and is run by a voluntary committee as a community resource. Rates start at just £10.00 per hour for weekday hire, £12.00 per hour for weekends before 6pm and £18.00 per hour for Fri, Sat and Sun evenings. We don’t usually charge for set up time and hold a Performing Rights Society for Music licence. We are happy to welcome organised youth groups (e.g. Boys /Girls Brigades, Scouting or Guiding groups) to hold overnight indoor camps in the hall. We charge £5 per person per night subject to a minimum fee of £100 per nights stay. To book the hall please contact Andrea Dewar using the contact page. The Hall Management Committee wish to thank the following for their generous donations that have enabled recent renovation works to take place.